Toss the ranch dressing with cabbage and set aside while preparing the remaining ingredients. Pre-heat oven to 425. Toss the thin slices of chicken with the dry spices. And bake on greased cookie sheet for 15 minutes. Remove chicken from oven and place taco shells into the oven to warm up for 5 minutes. Toss the chicken with the Frank's Red Hot. 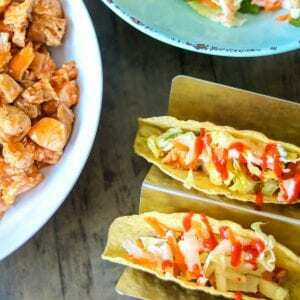 Using tongs, or a slotted spoon, fill the taco shells with the chicken and then top with the ranch slaw. Nutrition facts are based on homemade ranch dressing and corn taco shells.